An epic space adventure inspired by famous sci-fi novel. For Jinto Lin, his life was changed forever when his home planet Martine was taken over by the most powerful race in the universe - the Abh. There was no war, no resistance, only a brief negotiation between Jinto's father, who was the president of Martine, and the leader of the Abh fleet that covered the skies above the entire planet. For Jinto, his life as a member of the people of Martine ended that day. Now hated by his people, seen as the son of the traitor who sold his people out, Jinto was sent off to learn from the Abh - as the successor of the ruler of Planet Martine; a title he never wanted, a title he was forced to take on. Originally written as a well-known novel by Hiroyuki Morioka, Sekai no Monshou (Crest of the Stars) is a sci-fi anime unlike most that I have seen. The overall feeling toward this series is that the center of the attention was kept mainly on Jinto and Lafiel. The attention is not only to the events that they encounter on their way, but also a great deal of time was spent on psychological aspects as well. This focus gives the series a much stronger backbone to go on. 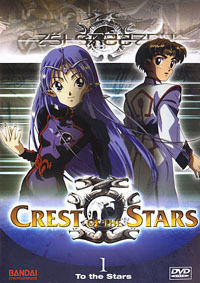 While most other sci-fi adventure series often use the typical story structure of a male hero fighting evil in space with several girls following close behind to create a love-comedy situation within the story itself, Crest of the Stars is a story that spends a great deal of time on Jinto and Lafiel, as individuals of their own race with very different backgrounds, and as a couple who help each other out at times of need as well. The very core of the relationship between Jinto and Lafiel and their different past experiences were depicted not only through the anime alone, but also through the words in the ending song "Ushinawareta Aozaora" (which roughly translates to "The Lost Blue Sky") performed by the group Time Slip Rendezvous, about a bird freed from its cage. Crest of the Stars itself was first aired at the beginning of 1999, and since the time that the first series ended, two more series following the same storyline have been released in Japan under a slightly different title - Battleflag of the Stars and Battleflag of the Stars II (the second series was first aired in Japan earlier this year). Even though the amount of computer-aided graphics were very minimal in comparison to highly regarded series that were recently released in the North American region such as Gatekeepers, the artwork and the special storyline still makes Crest of the Stars good enough to be a recommended title without a doubt.